It is that time of the year to pick Top 10s. 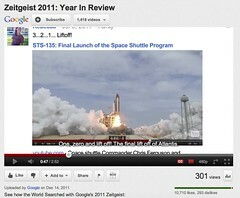 Here is my list of 10 favourite ads in 2011. Please share your favourite ad or ads in the comment section. Maria Aragon – Born This Way (Cover) by Lady Gaga – A self-promotional video by the 7-year-old Maria. A video that connected her with Lady Gaga and the rest is history and legend. I say a win-win for Maria and Gaga. BORN THIS WAY – Lady Gaga performs with Maria Aragon live in Toronto (March 3rd) – One small promise kept by Lady Gaga has helped Maria fulfill some of her dreams for sure. Lenovo “Boot Or Bust” Air Drop – Turning something as boring/technical as a 10 seconds boot time into a dramatic ad with its “behind the scene” making of video is definitely a great idea executed well. 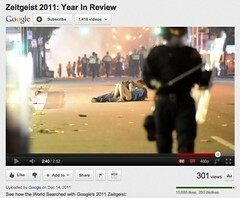 Zeitgeist 2011: Year In Review – A great way to advertise a whole bunch of Google products in a way that you want to watch the video! Nicely done. Until I can find a better alternative for “product placement”, I suppose translating it as “廣告植入” is not too bad. Taking colour association (色彩聯想) as a topic, the first thing come to my mind are the “brands” that tried/try to “own” a colour. Here are some examples. Green by Greenpeace or environmental causes. Pink by breast cancer foundations. Blue (Big Blue) by IBM. Orange by a revolution and a mobile operator. Yellow by a politician and her revolution. And even I have been using the exact same yellow in my website, something I haven’t talked about much. Of course, sometimes the colour instead of the ideas behind the colour can become a loaded-baggage like someone being branded “green“, which is why Kevin Roberts has suggested changing from Green to True Blue. For other writers’ articles, see 2weeks 1gathering. P.S. Some years ago, possibly after a random chat with my dad, I started to think about colours in reference to the Pantone colour matching system. In hindsight, I think that was a very “business-oriented” and scientific way of thinking about colour. Anybody who expected Steve Jobs to wear a hair shirt when he took the stage was bound to be disappointed. That the company responded at all is a testament to the power of at least one part of the press. When he got to the heart of what the company was going to do about the controversy, he cited Consumer Reports saying, “The bumper solves the signal strength problem” and its suggested remedy of free cases for all. “O.K., let’s give everybody a case,” Mr. Jobs said.